Jura ENA Micro 1 - Aroma + Aroma grinder and Micro brewing unit for the ultimate espresso •Touch panel for easy operation •Compact design requires minimal space •Eco-friendly - no plastic to through away and high energy efficiency! 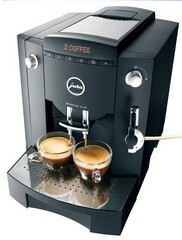 Jura Impressa F-9 One Touch coffee machine for espresso, americano, cappuccino, late, etc. As Jura Agent, we sell all Jura machines, Parts and Assessories. We also sell second hand models to the latest new Jura models.